Have you tried making desserts with vegetables? Carrot cake and pumpkin pie are some classics but modern chefs are incorporating vegetables such as beets, asparagus, mushrooms and sweet potatoes more directly into new creative desserts. 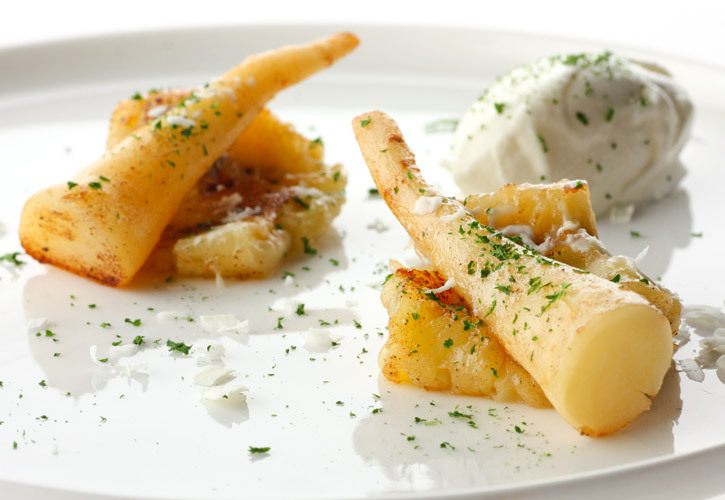 Parsnip, a root vegetable, is traditionally used in savory dishes but according to Foodpairing®, it has great potential to be incorporated in a dessert. The molecular analysis of parsnip shows many possible combinations with fruits, chocolate and honey. Think outside the box and use Foodpairing® to create surprising new dishes that really make sense in terms of flavor. A first recipe is focused on the fruity theme present in parsnip. Apricot, bergamote, blood orange, cranberry, grapefruit, guava, lychee and tangerine are only a few of matching ingredients that emphasize the parsnip’s fruitiness. 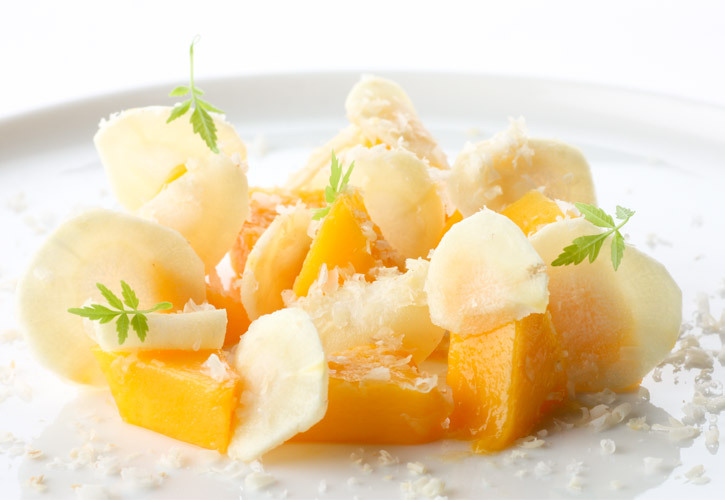 The banana-parsnip match was chosen for this dessert with the addition of parsley and milk. A second recipe is rather build around the spiciness of the parsnip. Again there are a lot of matching products to be found in the Foodpairing® website that go along well with parsnip in the spiciness theme. Buddha's hand, chestnut, kumquat, lime, grapefruit and raspberry are some examples. For this recipe, mango, hazelnut and Yuzu were chosen. 1- Peel the parsnip and cook it al dente in slightly salted water. Braise in butter. 2- Peel the banana and braise in butter. When al dente, add some sugar and lemon juice. Then allow to cool. This will preserve the texture of the banana. 3- Dry the parsley in a micro wave oven at 900W. Make sure to use a paper towel to absorb the released moisture. Also mix the parsley every 30 seconds until it is completely dried out. 4- Arrange all ingredients on a plate. 5- The milk ice cream will provide some freshness and texture contrast. 1- Make a brine by mixing the yuzu juice, water and sugar. Heat slightly to dissolve the sugar. 2- Peel and slice the parsnip. Marinate the slices in the brine. 4- Arrange the mango and the parsnip on a plate. 5- Grate some hazelnuts on top. You can learn more about Foodpairing® here. They even have a free version for you to try it!